NOTE: This article explains how to deploy an HTML email signature with images on a single iPhone. To learn how to manage HTML email signatures on multiple iPhones connected to Google Apps, Office 365 or Microsoft Exchange accounts consult this guide. The default iPhone email signature – ‘sent from my iPhone’ – has by now become sort of a running joke among users. With this in mind, if you are using your iPhone for professional correspondence, you might want to change it to something more appropriate. To do this you have to go to Settings App > Mail, Contacts, Calendars > Signature and type in your new byline. 1. 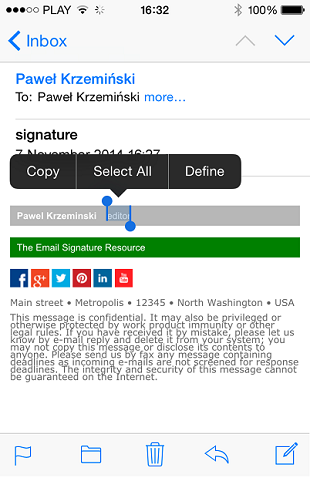 Design the signature in an email client that supports HTML, e.g. Gmail or Outlook (to learn how to create social network icons linking to your accounts see this article). IMPORTANT: For the signature to work correctly on your iPhone the images must be linked. This is a default in most webmail clients like Gmail, but not a default in standalone email clients like Outlook (learn how to use a linked image in Outlook). Fig. 1. An email signature (modified from this free template) designed in Microsoft Outlook. 2. 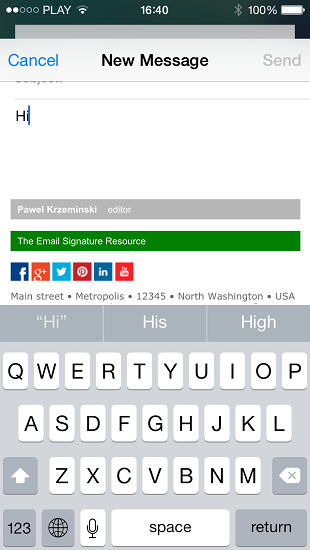 Send a blank email with the HTML signature to your iPhone. Fig. 2. A blank email stamped with the HTML email signature. Fig. 3. A section of text highlighted using the press-and-hold gesture. 4. When the context menu appears, choose Select All and then Copy. Fig. 4. The whole body of the email highlighted after choosing Select All. 5. Go to the iPhone email signature editor (Settings App > Mail, Contacts, Calendars > Signature), if you already have an email signature configured – delete it, press and hold until the context menu appears and select Paste. Fig. 5. Context menu triggered using the press-and-hold gesture. 6. After you have pasted the email signature into the editor, you will notice that it lost its original formatting and has been slightly altered. This is because your iPhone automatically added its own coding to the HTML source of the signature. 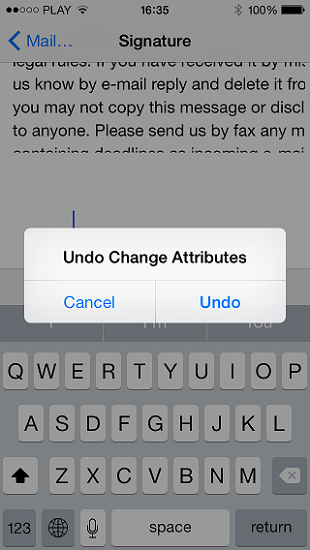 Shake your iPhone to trigger the Undo Change Attributes context menu and select Undo. 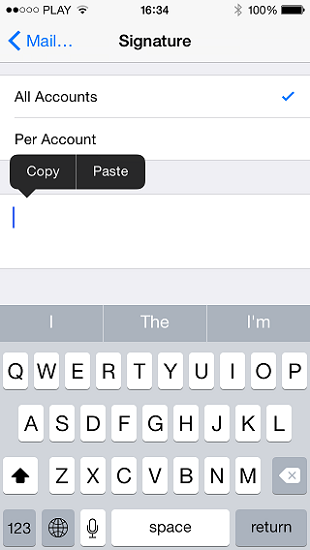 This will remove additional undesired formatting introduced by your iPhone. Fig. 6. Undo Change Attributes menu activated by shaking the phone. 7. Go to your iPhone Mail app and initiate a new message (it should already contain the new signature). IMPORTANT: Do not send the message. Instead, click Cancel, Save Draft. Go to Drafts (e.g. by holding the Compose button), locate the email and then copy and paste the signature from there according to steps 3 – 6. Remember to test the new email signature before sending any business emails! This entry was posted in iPhone on November 13, 2014 by Adam the 32-bit Aardvark. Actually now everything is working fine except for the image .. Which still shows up as a blank box … Sigh!! This Apple Support forum thread seems to discuss a similar issue: https://discussions.apple.com/thread/5996947?start=0&tstart=0. One of the suggested solutions is saving the email with the email signature in Drafts on your iPhone (to do this begin to forward the message, but instead of sending just save it), and copying from there i.e. carrying on from step 3 of my walkthrough. Hi Linda, What iOS version are you using? Sorry for not replying sooner. I will test this next week and get back with the result. ok, it looks like there are 2 requirements that need to be fulfilled: the image has to be linked (i.e. located on a public web server and downloaded from there) and the message from which we copy the signature with the image must be saved to drafts and not deleted. I’ve added this info in steps 1 and 7 of the article. Was “playing around” since a while with this issue. Would have never figured out this simple solution without your article. This works great for me… except the text of my emails (not the signature) now arrives in Times New Roman, which is not particularly attractive. Is there any way to get around this? This could be caused by an error in your email signature code (even a minor one, like a missing closing tag). I’d start with reviewing it. 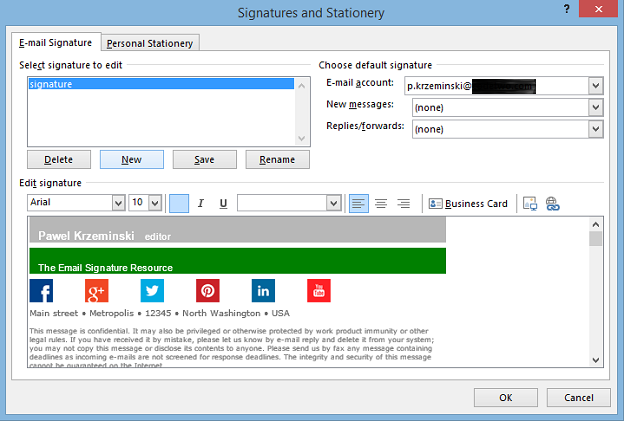 Alternatively, use one of our free templates (http://www.mail-signatures.com/articles/signature-templates/) instead of your current one. That’s correct – if an image is too wide, your iPhone will scale it to fit the screen. Hi Antonio, No, the image should “stay” in the signature. Are you using a linked or embedded picture? None of this works! The image always breaks and does not “hold” in drafts, in my signature, etc. It only works a couple of times. So frustrating when trying to brand your logo and using my email from my Iphone 50% of the time! Hi Augie, What type of image are you using – linked or embedded? A linked image (http://www.mail-signatures.com/articles/images-in-email-signatures-linked-or-embedded/) should hold in the signature. 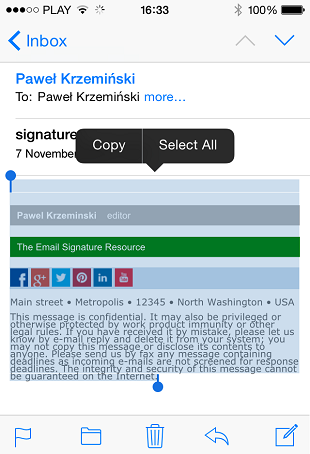 Does anyone know how to add a HTML signature in the outlook iOS iPhone app? Everytime I copy and paste it into the app my signature is appearing in plain text. Did you ever get it to work? I had it working in Apple mail but it refuse to work in Outlook for IOS! Your directions are so clear, thank you! However, i paste into Signature and then ‘undo changed attributes’ then go to the Gmail app and initiate a new email BUT the sig is not there. So, I opened the “Mail” app, that is the standard iphone generic thing that contains icloud, Gmail and and any other emails set up on the phone, then to “Accounts” then gmail, then start a new mail (icon, bottom right) , a new mails starts and the signature is there. I haven’t tested the solution with the gmail app, so I can’t comment on the issue. As to saving to drafts – make sure to provide a recipient address in the email (as if you were actually going to send it) and only then tap cancel/trash. I got a problem. I don’t have any website. I want to create a email signature that will open in all kind of devices. *1. I cant understand how I link my photo/logo in html code, because i don’t have any website. 2. Is it necessary to link social media icons as like my photo for clicking? 3. Can I use a html email signature in all platform & devices? 4. Its necessary to design a psd esignature template to convert in to html. My qurey become to long. Pls try to give those answer but most importent is my 1st question. Following these directions worked perfectly, until I closed and reopened the email app. Then the images were gone again. I have linked the logo image to my website, but all that did was make it a click-able button that took me to my website. Can you please explain to me what you mean by, “the image has to be linked (i.e. located on a public web server and downloaded from there)” and how do you do this? I also need this work for PCs and Macs. PS….I am a graphic designer who knows very little about coding. I tried shaking it, and nothing happened. No “undo” option available. Hi! Do you have Shake to undo enabled? You can check in Settings, Accessibility. But would you tell me how to have my signature with the image in an IMAP?! Coz when shake in an IMAP signature settings, the undo action clear every thing and not changing the format! Hi Mahboob, Most IMAP accounts have built-in email signatures. For example, see this article about setting up an email signature in Gmail: https://www.mail-signatures.com/articles/how-to-add-or-change-an-email-signature-in-gmailgoogle-apps/?sts=4145. Where is your IMAP account hosted? I was able to copy my signature and it works fine, however the information is crunched together and does not look the same as when I send from my desktop. Any suggestions? Hi Jane, Did you remember to undo changes as per step 6? Linked images should not become attachments – that is one of the differences between linked and embedded images. Could you please specify how you insert the image into your email signature? I would like to add the Image centrally in office365, so that this image is sent out in all mails (exchange, owa and mobile also). can you help me without using third party tools? CAn we use the disclaimer and how to generate the HTML code? 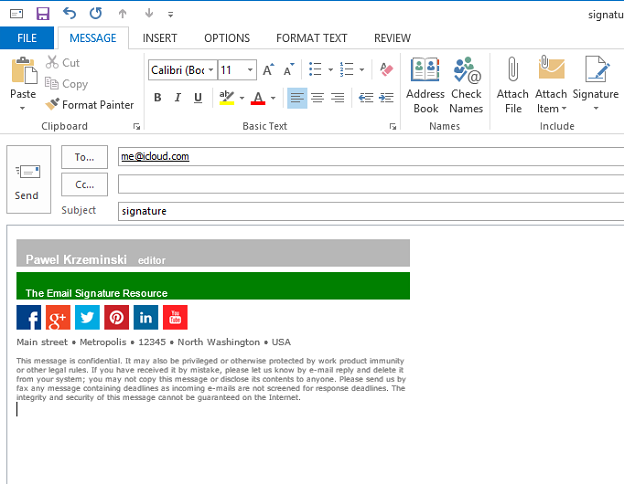 The article How to create company-wide email signatures and disclaimers in Office 365, will provide you with detailed instructions on how to set up such an email signature and disclaimer. The easiest way to generate the HTML code for your signature is by using Free Email Signature Generator. Just choose Exchange Online as your platform and follow the instructions. Awesome! Worked like a charm. And that shake the phone for a context menu? I’ve had an iPhone with my company for 6 years and that’s the first time I’ve ever seen that trick. Brilliant and thanks so much.